June 8th, 2012: Sharing 4 scoops of ice cream and enjoying learning how cheese is made – and enjoying being out of the rain. Skip, you aren’t going to get very far if you kep eating scoops like that! Molly will have to carry you!! !Have fun! Godspeed!! Looks like you guys are having a great time. Hope that feeling never wears off. How has camping been? Love you both. I just figured out how to get to your photos and I have checked each day since I bookmarked it last Sunday. You both look happy (or contented lying down) in each picture. The trip must be agreeing with you. 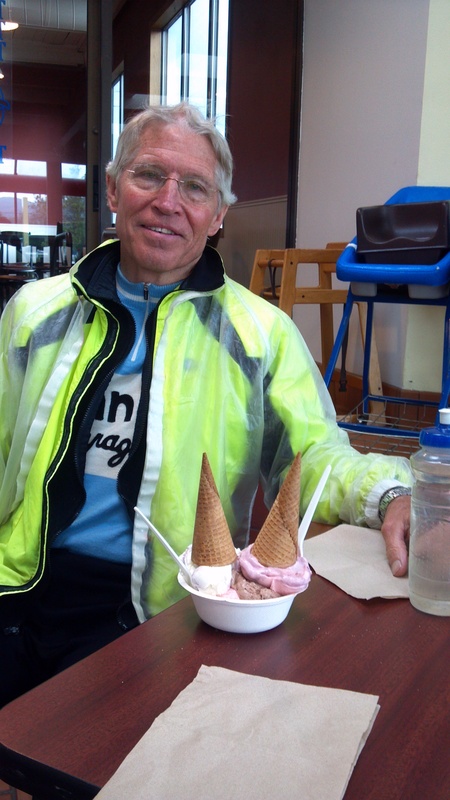 I better get out riding so I can eat a pile of ice cream like that. It looks awfully good.